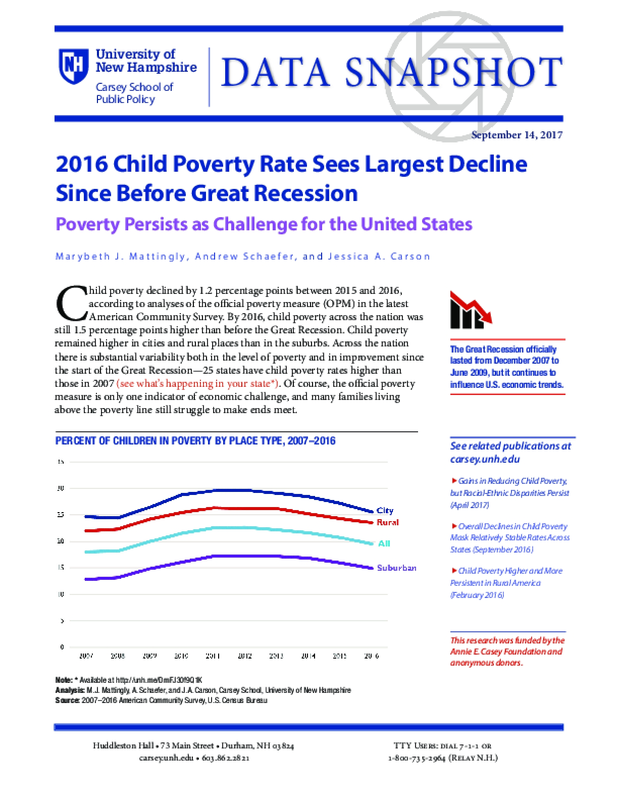 Child poverty declined by 1.2 percentage points between 2015 and 2016, according to analyses of the official poverty measure (OPM) in the latest American Community Survey. By 2016, child poverty across the nation was still 1.5 percentage points higher than before the Great Recession. Child poverty remained higher in cities and rural places than in the suburbs. Across the nation there is substantial variability both in the level of poverty and in improvement since the start of the Great Recession—25 states have child poverty rates higher than those in 2007 (see what's happening in your state). Of course, the official poverty measure is only one indicator of economic challenge, and many families living above the poverty line still struggle to make ends meet.